Is Twitter a Trend, a Fad, or Something Else? That was a question posed by VoIP pioneer Jeff Pulver recently. Where else? On Twitter. To his question, prominent blogger and highly regarded VC Fred Wilson answered, "it's an asynchronous and public form of chat." It is that - but it is much, much more. 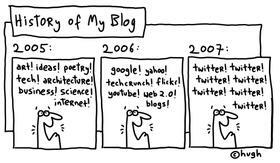 The plan is; I shall reserve gapingvoid for cartoons and the longer, "substantive" posts. The day-to- day minutiae [including travel details when I'm on the road] and random links etc I shall move over to Twitter. to mine the collective consciousness, to learn more about all of us from the small messages we send. As for grand conclusions about patterns of human interaction, those are as easily interpreted by listening to a group of seagulls or watching ants. The patterns defy recognition and the disparate voices do not add up to a digital chorus. There’s much more to it than group conversation. It’s a new way of interaction, communication, learning, and relationship-building.